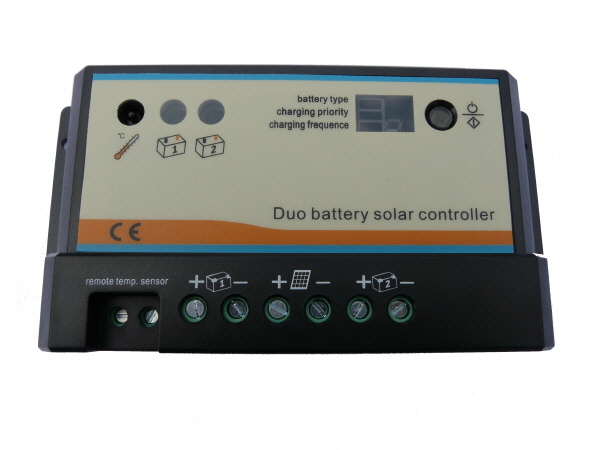 Our latest Dual-battery charging solar controller eliminates the added cost of two separate solar charging systems. The controller uses Pulse Width Modulation (PWM) the most effective means to achieve constant voltage battery charging, the result is a higher charging efficiency, rapid recharging and healthy batteries at full capacity. This controller is ideal for use with motorhomes, caravans, boats or anywhere there are two independent batteries for instance a starter battery and a leisure battery. The Charging percentages for each battery can be set manually if required. PWM charging, different frequency option.